Post: The BUMAT 2019 admit card is also available offline and is sent via post by the conducting body. Details: The BUMAT 2019 admit card will indicate the details of the candidates such as Roll Number, Test Center allotted and complete address of the test centre, name, photograph etc. Note: No candidate will be allowed to appear for the BUMAT 2019 examination without a admit card and an Id proof. Candidates need to log on to the official BUMAT 2019 website. 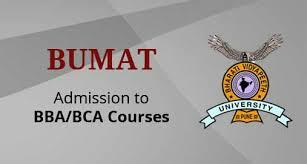 Click on the link given for BUMAT 2019 admit card downloads. Candidates need to fill their course and username. The BUMAT 2019 admit card will be displayed on the screen. Save and Print the BUMAT 2019 admit card. Discrepancies: The BUMAT candidates must note that if they don’t receive their BUMAT 2019 admit card, then they must contact their nearby centre before the date of the test for collecting a duplicate admit card. Mutilate: Candidates must not mutilate the BUMAT 2019 admit card once the authenticity of the BUMAT 2019 admit card is established. Plagiarizing: Plagiarizing the BUMAT admit card is a punishable offence. Future Reference: BUMAT 2019 Applicants must preserve the BUMAT 2019 admit card until the interview/ admission process gets over for the purpose of verification. Details: It is essential for all candidates to verify all the details mentioned on the BUMAT 2019 admit card. Incomplete: The BUMAT 2019 admit card will not be issued if the candidate's application is incomplete. Mandatory: A candidate failing to produce an admit card will not be eligible to write the BUMAT 2019.